This book consists of two parts. First is 'fruits of belief' and the second part is 'a decisive proof of God.' Fruits of Belief’ is about dispelling the darkness of too much worldly goods used to put today's man in a state of neglect and giving light to the future by means of awakening heart and mind. 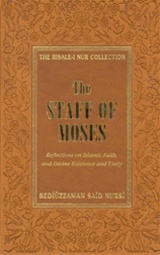 In the author's words: "just as the staff of Prophet Moses caused twelve springs to gush forth and was the means of eleven miracles, so the present collection (The Staff of Moses) consists of the eleven light-scattering topics of 'The Fruits of Belief,' and the eleven certain proofs of 'The Decisive Proof (of God),' " thus, this book receives it's name The Staff of Moses, and a source for life-giving waters for strengthening one's faith. Bediuzzaman Said Nursi was born a century ago, in 1873, in a village in eastern Anatolia, Nurs, from which he received the name Nursi. He received his basic education from the best-known scholars of the district. The extraordinary intelligence and capability of learning that he showed at a very early age made him popular with his teachers, colleagues and the people. When he was sixteen years old, he silenced the distinguished scholars who had invited him to a debate (debate was then a popular practice among scholars). This later recurred several more times with various groups of scholars, and he thereby began to be called Bediuzzaman (Wonder of the Age). The time he spent in education paved the way in his mind for the thought that at a time when the world was entering a new and different age, where science and logic would prevail, the classical educational system of theology would not be sufficient to remove doubts concerning the Qur'an and Islam. He concluded that religious sciences should be taught at modern schools on the one hand, and modern sciences at religious schools on the other. "This way," he said, "the people of the school will be protected from unbelief, and those of the madrasa from fanaticism." After completing a lifetime of almost a century, with every minute spent in the service of faith, Bediuzzaman Said Nursi departed from this world on the morning of March 23, 1960, with complete honor, dignity and victory, leaving behind him the Risale-i Nur Collection that would illuminate this and the forthcoming centuries and a love that would be handed over from generation to generation until eternity.